Thanksgiving is around the corner! Turkey is the staple centerpiece dish for our Thanksgiving feasts, but are you or any others in your family non-turkey lovers? I know the holiday doesn’t feel the same without a turkey to gather around, but why not another option for those that are not too fond of turkey? Or, maybe you change it up this year and gather around these hens instead? Perhaps you’re entertaining a smaller group or it’s just you and your significant other. The great thing about cornish hens is you can serve one per person and they cook in about one short hour. 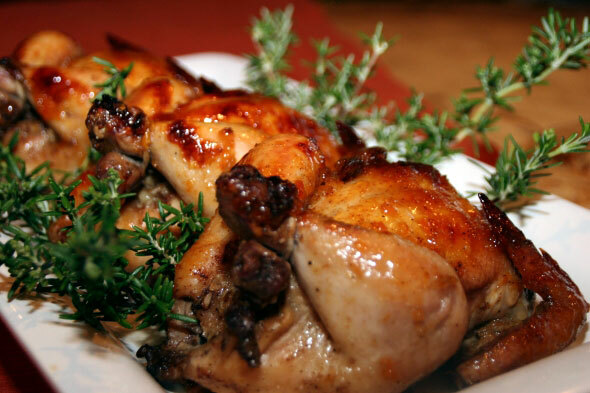 Cornish hens are more tender than a whole chicken with mostly white meat. Although tender, I went the extra mile to brine them. After brining my turkey last year I learned that if you don’t brine you’re missing out on a juicier, moist and more flavorful piece of meat. Brining also speeds up the cooking process and good news, these hens only require 2-3 hours of brining time! The orange peels in this simple brine create an aromatic base that allows the spice rub flavors to sink right in. If you don’t have the time for brining, it’s completely optional and the hens will still taste delicious. The flavors in this recipe are both savory and sweet none of which are over bearing. If you don’t want to use butter, walnut oil is an alternate option that’s pleasingly delicious. It adds a slight nutty flavor and is complimenting to the other ingredients. I made this dish with the inspiration of fall and the holiday season, however it would be a hit for any occasion, big or small, any time of year! Your knife will sink right thru these tender, juicy and fragrant hens; a beautiful centerpiece dish for any occasion. Brine Hens: Bring water, kosher salt, sugar and orange peels to a boil, stirring until salt and sugar dissolve. Remove from heat and cool to room temperature. To speed cooling process, add ice cubes and refrigerate until completely cooled. Place 1 oven bag into second bag slightly folding over edges to prevent spilling. Place in a large deep bowl. Place hens breast side down into bag, pour brine (with orange peels) into bag until hens are covered. Press out any air and seal bag. Refrigerate for 2-3 hours. Remove hens from brine. Rinse hens inside and out with cold water and pat until dry with paper towels. Preheat oven to 450 degrees with rack in center. Place hens in roasting pan breast side up and tie legs together with kitchen string. Lightly sprinkle skins and cavities with sea salt and fresh ground pepper. Mix garlic, cinnamon, cumin, coriander and 8 tablespoons melted butter in a small bowl. Rub mixture all over skins and cavities, running fingers gently under skins to spread mixture underneath. Tuck wing tips under and place in oven for 15 minutes. Reduce temperature to 400 degrees, add 1 cup Chicken broth to roasting pan and roast 30 minutes longer, basting occasionally adding additional chicken broth if needed. Prepare Apricot Glaze while Hens are Cooking: Melt 3 tablespoons butter in a small sauce pan. Add shallots and sauté until softened, about 2-3 minutes. Stir in wine and chicken broth and bring to a boil until reduced to half, (3/4 cup) about 10 minutes. Stir in apricot preserves and simmer until thickened, about 5 minutes longer. Season with freshly ground sea salt and black pepper to taste. Set aside. Remove hens from oven and generously brush apricot glaze all over hens, reserving a small amount for later use. Place hens back in the oven and roast until golden and juices run clear, about 15-20 minutes longer, basting occasionally. Remove from oven and brush with any leftover glaze. Transfer to a platter and garnish with fresh rosemary sprigs. *Hens may be brined, drained, rinsed, patted dry and refrigerated up to one day ahead. Skins will also be crisper if refrigerated after brine.